I've finished reading my 5th book now. I started reading it this morning around 9 AM when I got out of bed and it's taken me roughly 3 hours to read. 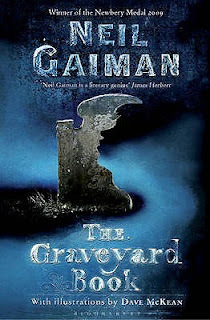 The Graveyard Book by Neil Gaiman was a reread, I bought and read it sometime back in 2009 or 2010 and I think I understood it better this time round. Many of the early chapters are small stories in themselves, independent adventures the boy has throughout his childhood, but it starts and ends with the main story and it's a great read. Gaiman is such a talented and creative writer and I love his flow and style. All in all the tale of Nobody, a boy who grows up in graveyard raised by ghosts, is something else and definitely worth it.